In its original form, all choices are actionable as long as the contract is active. Locking by State requires introducing fields to track state. This allows for the creation of an active contract in two possible states: locked or unlocked. A DAML modeler can selectively make certain choices actionable only if the contract is in unlocked state. This effectively makes the asset lockable. The state can be stored in many ways. 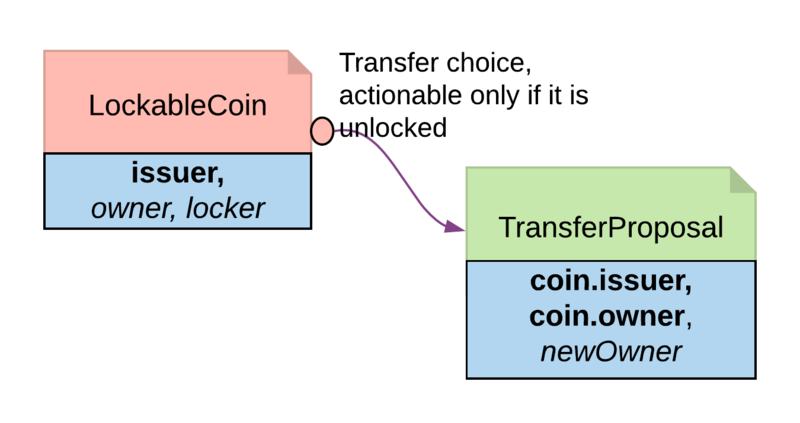 This example demonstrates how to create a LockableCoin through a party. Alternatively, you can add a lock contract to the asset contract, use a boolean flag or include lock activation and expiry terms as part of the template parameters. Here are the changes we made to the original Coin contract to make it lockable. Add a locker party to the template parameters. The contract state is checked on choices. It requires changes made to the original contract template. Furthermore you should need to change all choices intended to be locked. If locking and unlocking terms (e.g. lock triggering event, expiry time, etc) need to be added to the template parameters to track the state change, the template can get overloaded.